The Rock is becoming one of the biggest movie stars in the world. So it’s only fitting that he takes on some of the biggest monsters in the world. Hot off of the success of Jumanji: Welcome to the Jungle, The Rock is ready to take on an actual video game property. 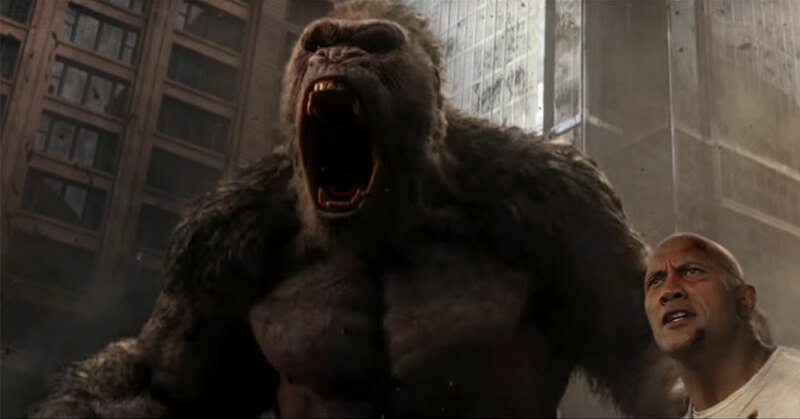 Based on the classic arcade game, Rampage pits The Rock versus giant monsters. But as the latest Rampage trailer shows, The Rock will be teaming up with one of the monsters. Check out the latest trailer for Rampage. Of course, it’s extremely difficult to adapt a video game into a movie. Many have tried and many have failed. Yet The Rock seems to have a good track record when it comes to films that he produces. As previously mentioned, we’ve already seen that in Jumanji so it’ll be interesting to see what he does with Rampage. After all, in order to adapt a video game into a movie, you’re going to have to change up the story a bit. You also need to make it fun and exciting. What we’ve seen from the Rampage trailer is that The Rock has done all of that. Now, we don’t know if it’s going to be good but at least it’s a step in the right direction. Rampage destroys theaters on April 20th. The post It’s The Rock vs. giant monsters in the latest Rampage trailer appeared first on Nerd Reactor.